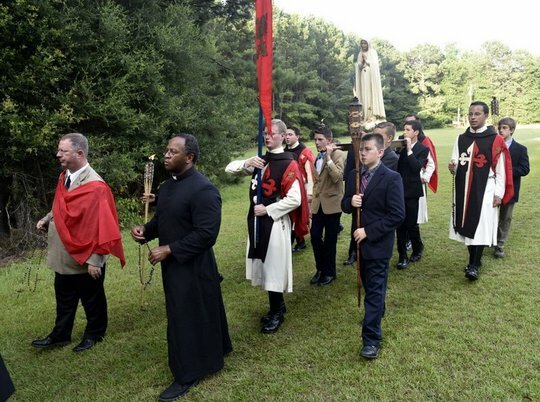 By the grace of Our Lady, TFP Louisiana has just concluded the 15th annual Call to Chivalry Summer Camp in Louisiana. Over 50 young men, a handful of fathers and TFP volunteers were eager to confront the challenges and adventures that awaited them: an unforgettable seven-day program full of inspiring talks, exciting games, formative activities, and extraordinary graces. Get information about future camps. The peaceful location of the camp offered the perfect opportunity for young men to discover medieval treasures and Catholic heroes, free from the temptations and distractions of the contemporary world. Feliciana Retreat Center provided a spacious meeting hall with a dining room, as well as sleeping quarters, all within 219 acres of large green fields and surrounded by thick groves of serene green forests. Participants would soon find themselves tackling a fast-paced schedule. Each day started with a bagpipe and drum reveille. A detailed inspection of the rooms ensured that everything (and everyone) was in proper order. A few push-ups might ensue, perhaps because a bed was not correctly made, or shoes were out of line. Afterwards the boys lined up outside to chant the Credo while the American, Papal, and TFP flags were raised in solemn fashion. Everyone then would march to breakfast singing We Want God, a hymn composed by St. Louis de Montfort. These activities strengthened the boys spiritually and prepared them to take on the challenges each day. The theme of the camp focused on the history and marvels of Catholic Spain. Throughout the camp engaging talks about Catholic doctrine, lofty ideals, and riveting accounts of battles immersed the boys in the glorious history of the Reconquista, a crusade to drive the Moors out of Spain that lasted over 700 years. The young men listened attentively as the lives and heroic deeds of Spain’s greatest Catholic heroes unfolded before their eyes. They learned how the Reconquista began in a tiny, forlorn cave called Covadonga where in 711 a Visigoth noble, Don Pelayo led a ragtag but resolute band of 300 Christians to victory against a Muslim army of 60,000 soldiers. Then there was El Cid Campeador, one of Spain’s archetypal heroes who remained a steadfast and honorable vassal even when his king mistreated and banished him. Another talk unveiled the life of King St. Ferdinand III, a true model of Chivalry, uprightness, purity, and valor, who spent his entire life crusading to free Spain from Islam. He never lost a battle. A presentation showed the life and works of St. Ignatius of Loyola. The boys also learned of the famous Siege of the Alcazar of Toledo during the Spanish Civil War (1936-1939), during which Catholic troops held up in the Alcazar survived a brutal and painfully long siege, but finally saw victory. The boys and dads watched a lively skit depicting a scene from this siege. Other talks covered topics such as architecture, the bad effects of Rock and Roll, and the phenomenon of “The Revolution”, the satanic process that seeks to undermine and destroy the remnants of Christian Civilization. TFP members also gave a presentation on TFP campaigns, and academy students talked about the St. Louis de Montfort Academy, which evoked many questions and lively discussion. Between talks and other indoor events, the boys were taken outside to participate in numerous field games. Summer camp games included French football, shield ball, steal the bacon, dodge-ball, capture the flag and sword battles. After dark, the boys played prison break in which guards with flashlights attempt to capture “prisoners” and prevent them from being freed. In keeping with the spirit of the theme, the boys enjoyed a premiere culinary experience. The dining room was ornately decorated and a huge paella, a popular Spanish dish, was prepared and served, topped off by a delicious Tres Leches cake with whipped cream and blueberries. Despite the scoffs of those hostile to God and virtue, the virtues of Chivalry are not theoretical, bygone dreams that belong in dusty museums. Rather, they are valid and applicable right now, especially in the fight for marriage and family. With this in mind, the boys participated in a public campaign in Baton Rouge, Louisiana in defense of true marriage. Standing under the hot sun, the boys prayed the Rosary and held up signs to passers-by. 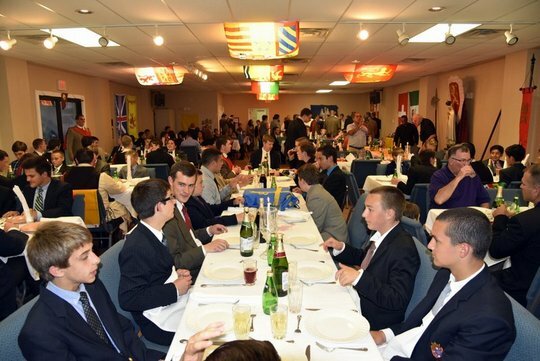 Many participants commented afterwards that the campaign was their favorite part of the camp.Besides the games and lectures, the boys had numerous opportunities to receive the Sacraments. Confession and Holy Communion were available each day thanks to Msgr. Robert Berggreen. Several boys were also enrolled in the brown scapular for the first time. Every day after dinner, everyone got in line for a Rosary procession while four boys carried a statue of Our Lady of Fatima, flanked on each side by torchbearers. The whole ensemble gave a sacral touch to the evening which aimed to instill a tender devotion to Our Lady among the camp participants. TFP member Mr. Byron Whitcraft talked about the history of the holy Rosary and the necessity of praying it, as requested by our Lady of Fatima. On the final day of the camp, the boys donned their heraldic tunics and competed against each other in the medieval games. For three intense hours they scrambled, tackled, and tumbled while family members cheered them on. A spirit of Chivalry and sportsmanship permeated the atmosphere. 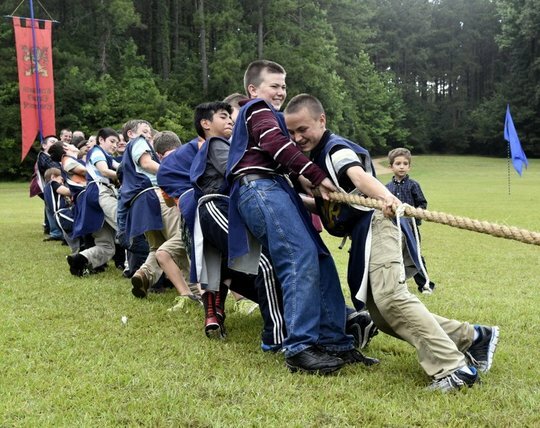 The games ended with the customary tug-of-war and a race through a grueling obstacle course. After having cleaned up and donned their best attire, a final torch-lit rosary procession made its way to banquet hall. This time the statue of Our Lady was flanked by a TFP honor guard in ceremonial habit. Arriving at the main hall, the participants and families found the room transformed into a beautiful medieval banquet hall. 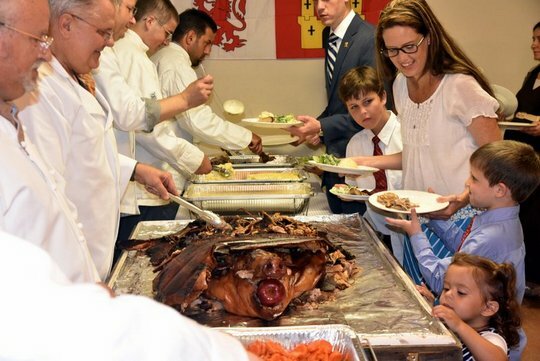 A whole roasted pig, prepared by the dads, was laid out upon the table alongside many sumptuous dishes for the admiring gazes of the hungry boys and guests. Lively conversation and camaraderie dominated the atmosphere. 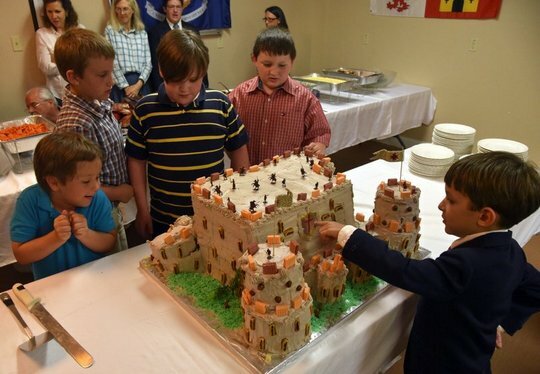 Towards the end, a magnificent castle cake resembling Manzanares el Real, prepared by several of the mothers, was brought out… and was duly devoured. 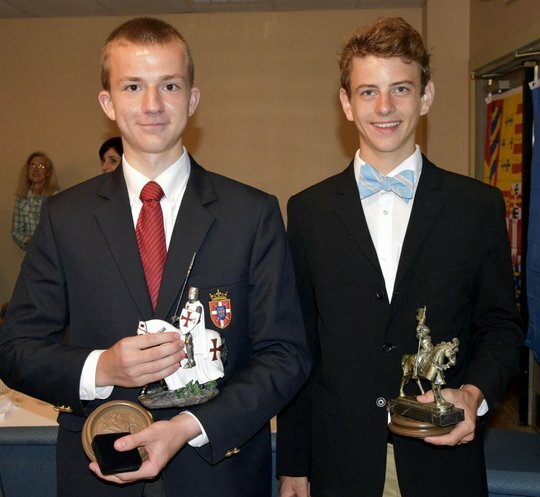 Prizes were given out to the winners of the tournaments as well as those who memorized the Ten Commandments of Chivalry. Each boy also received a beautiful memento to take home: a bronze desktop plaque with an image of El Cid Campeador emblazoned upon it. With the camp finished, most of the boys packed their belongings and departed for home. After such a memorable time, many of them were sad to leave. But as they drove away, all could agree that they felt a sense of accomplishment, a renewed confidence and devotion in Our Lady, and the determination to confront the world for the restoration of Christian Civilization.